After working my way through Weight Watchers for the past two years, I’ve become super-comfortable in my routines. Sometimes, a little too comfortable… with a few of those weeks ending in a weight gain. However, most times, I had major scale-related (and non-scale-related) victories (hello, dropping 4 sizes!). I’ve changed my entire outlook on food and I really can tell the difference in eating healthy & feeling good versus pigging out & wanting to burst. I’ll never know why I didn’t think of this smoothie first. It’s so simple, it’s not funny. And as soon as I saw it, I couldn’t wait to get home and blend one up myself. There are so many possibilities to making this smoothie your own, it’s genius. I also kind of love drinking anything out of a mason jar, so there’s that. Place the fruit in a blender, then top with flavored water. 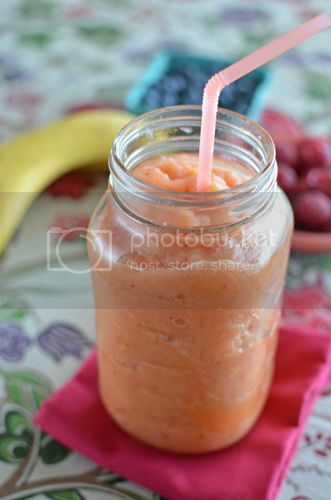 Blend until smooth, then pour into a mason jar and enjoy! 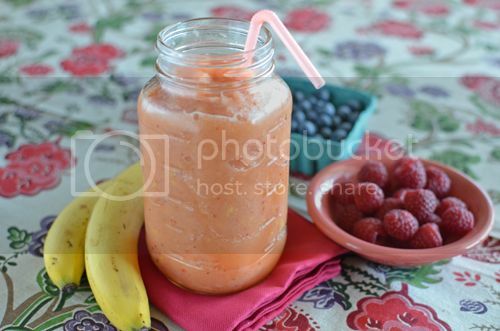 Jessica, such a very pretty (pink) presentation of a delicious and easy smoothie in a Mason jar! Love this idea! 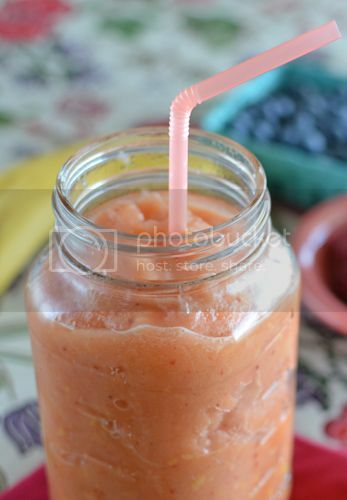 A smoothie with no milk products = a smoothie I can drink – awesome! And mason jars just make everything better. Hi Jessica, My WW leader told me that fruit is zero points unless it is combined with other fruits like fruit salad, or if you make it into a smoothie. Have you ever heard this? Thanks!